With 30-40 degree days looming on the horizon, taking a dip in the pool or a trip to the beach can be a great way to cool off. Summer, activities in and around the water can be great fun, but sometimes can be dangerous. It can take less than a minute and only a few centimetres of water to drown. Accidents can happen anywhere – at a friend’s place, at the beach and even in your own backyard. In the last year alone 271 people drowned in Australian waterways. Even if you are a competent swimmer, you can sometimes find yourself in trouble around water, so make sure you are aware of your surroundings and follow the different rules around different bodies of water. 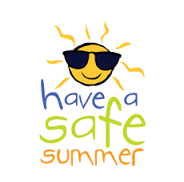 Stay safe this summer! Children under 5 years of age need to be within arm’s reach in and around the water. Always check the depth of the pool & swim in a depth that is safe for you. Always look before you jump or dive into a pool. If the water is too shallow, you may hurt your neck! Always shut the pool gate. Always swim between the red & yellow flags at a patrolled beach. If you get stuck in a rip, don’t panic! Raise your hand and wait for lifeguard help. Always wear sunscreen if swimming outside, and wear a hat and sunglasses.